The Aloha Koi Appreciation Society and the Kodama Koi Farm present their first koi show, to be held at McKinley High School. The event begins at 10 a.m. tomorrow with an opening speech by former Gov. George R. Ariyoshi, chairman of the Aloha Koi Appreciation Society. 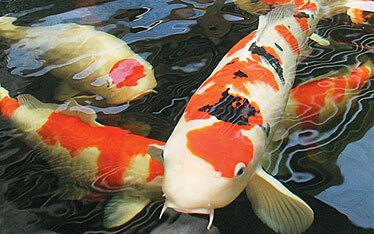 More than 200 koi entries will be on exhibit, some valued at $20,000-plus, competing for the title of grand champion. Hours are from 9 a.m. to 5 p.m. tomorrow and 9 a.m. to 2 p.m. Sunday, with the awards ceremony taking place from 11 a.m. to noon Sunday. The AKAS was founded by Ariyoshi and Mamoru Kodama of Kodama Koi Farm to promote and share the experience of raising and exhibiting Japanese koi. Call 623-2997 or e-mail Hiroko@kodamakoifarm.com. Composting with Evelyn: Evelyn Giddings will lead a hands-on workshop on how to build and harvest a compost pile. A detailed booklet of composting methods will be provided. Hours are 10 a.m. to noon. Cost is $15. Graywater Harvesting: Jeremy Cann will teach a class on "graywater" catchment systems that reuse water drained from baths, showers, washing machines and sinks, for irrigation and other watering applications. Class hours are 1:30 to 3:30 p.m. Cost is $15. Keiki Explorer Club: Keiki ages 4 and up can get up close and personal with worms and learn how organic waste can be made into compost by feeding it to worms that eat food scraps, cardboard and newspaper. A project includes learning how to make a worm home out of recycled containers. Hours are 1:30 to 3 p.m. Cost is $12 per parent/child team. Advanced registration is required for all classes. Call 524-8427 or send e-mail to thehawaiigreenhouse@hawaiiantel.net.